The one and only Regular Classic! The one that made ChapStick America’s favorite lip balm and the one that our hearts still beat for. Rub it on exposed skin to help prevent frostbite in very frigid weather. When your hands become severely chapped and cracked you can rub it on to stop small cuts from bleeding. Other areas you may use Chapstick Original are on dry elbows, nail cuticles, and on the ends of your hair to stop flyaways. 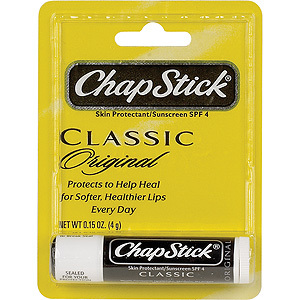 Chapstick Original Lip Products in Bulk Quantities. Chapstick Original. Buy in Bulk at Low Prices.